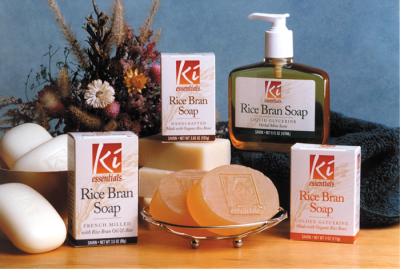 Kina, LLC approached Peter Harris Creative (PHC) to create an identity for a proposed line of soaps to be marketed under the Ki Essentials name. First, we gathered and assimilated data about product attributes, trends, competition, distribution, and retailer and consumer buying habits. As the first line of soaps were under development, we and company officials engaged in a series of lively discussions about how best to present the brand and products. By the time the first items–a line of Rice Bran Soaps–were launched, the rudiments of a comprehensive identity program were in place. Later, additional brands (Organic Mountain Coffee) and products (Wild Yarn Soap, Lemon Soap) were added. And as the product line expanded, so did the perimeters of the identity program and the role we plated in the company’s overall presentation. We created advertising, point-of-purchase and other merchandising materials, and a trade show booth. The company has been well received by brokers, distributors, and retailers. Better still, the products are a big hit with consumers. I have known you and respected your work for years. It was only natural that we would turn to you for help with our latest venture.